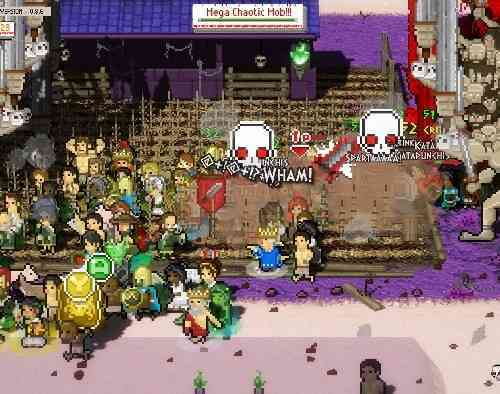 About a year ago at Pax Prime 2015, I had the opportunity to try out a quirky little game called Okhlos. To my surprise, its simplicity and straightforwardness was extremely refreshing and a large plus for the game. 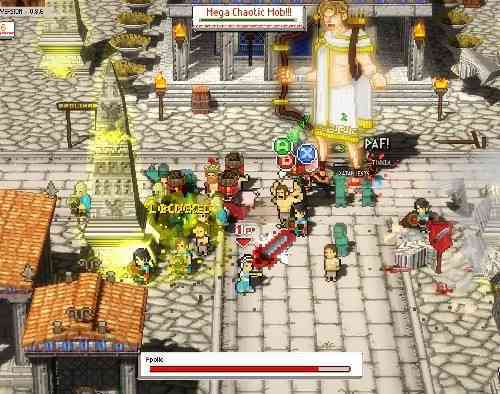 Flash-forward a year later and we have the release build of Okhlos all jam-packed with fixes and updates. Let’s see how it’s evolved. 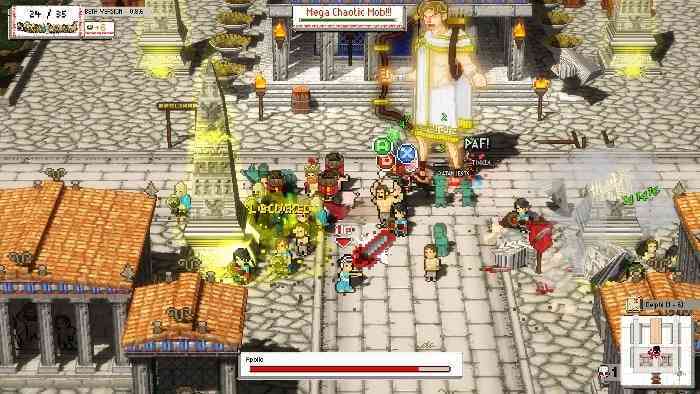 Okhlos is simply a game about an angry Greek mob rebelling against the gods of Greece. 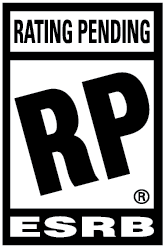 It may seem far-fetched and even trivial, but is honestly a solid foundation and rather perfect premise for the gameplay. 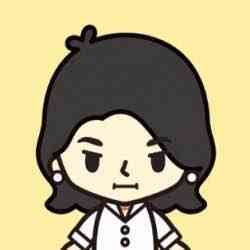 This is bluntly because the game is all about three key words – “angry”, “Greek”, and “mob”. The narrative is quite enjoyable as it’s all done in past tense making your playthrough a part of history. Not to mention, quite cute and funny. 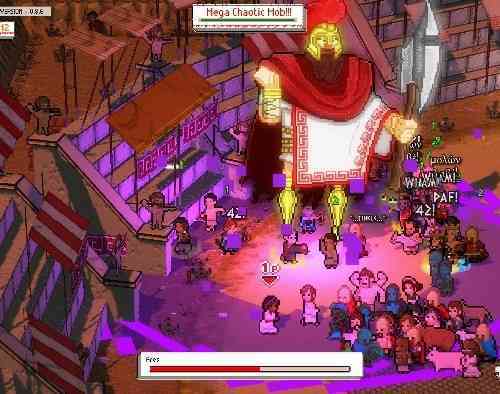 Okhlos has you progress through a couple of areas and an eventual final boss throughout multiple stages. 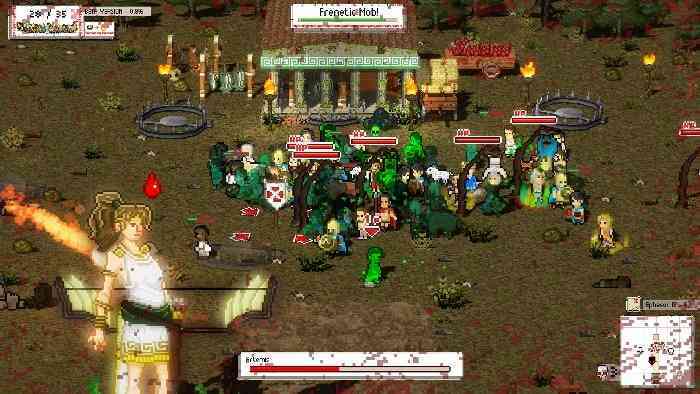 You’ll control both a main philosopher as well as a mob and must keep at least one philosopher alive or its game over. As you venture through each stage, you’ll gather members for your mob to trample enemies and destroy surrounding structures. Whether you gather them right off the land or obtain them from trades, your mob can be customized easily. Command them to sprint, spread out, stay close together, attack, or defend as you make your way to each Greek god. Aside from the immense fun you get by destroying and trampling things in the game, the other great part of the game is the adjustments you can make to you mob. While you will always play a main philosopher who guides the mob, the mob itself can have a wide variety of regular units and heroes – attackers, defenders, slaves who can carry items, heroes that give stat boosts/have special abilities, as well as other philosophers for backup in case your main one perishes. Each unit has its very own stats as well as unique name giving a sort of uniqueness to each one. You’re bound to find a unit that you’ll absolutely need to have within your mob. 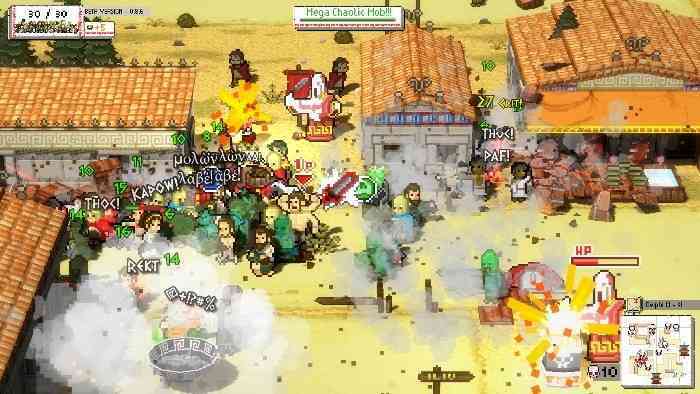 The main mechanics of the game involve the mob’s rage bar as well as battle flow in terms of attacking, defending, and various items/hazards. 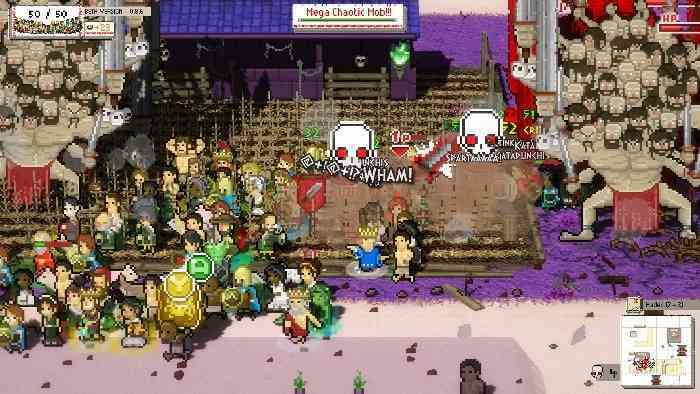 While the mob’s rage bar continuously depletes over time, trampling and defeating enemies fills it and allows your mob to be more “rampageous” so that they can destroy buildings and other environmental structures. Meanwhile, the first couple of areas may seem like a breeze to get through, later areas will require you to really time your blocks and usage of items. The difficulty spike may be a bit much for certain players, but nothing short of practice and multiple playthroughs that’ll really enhance those mob commanding skills. There were a few occasions that a philosopher would glitch into unreachable trees forcing a game restart, but surely these will be dealt with in future updates. Nothing game breaking nonetheless which is always a good sign. Visually, the game is pixelated to add to the quirkiness and fun. It’s colourful and bright, all showing structures Greece is known for. Togas and other memorable outfits were also not forgotten (Sparta anyone?). The layout for the game is also organized in such a way that once you pop up the menu you’ll be able to easily find individual unit stats or overall mob stats. 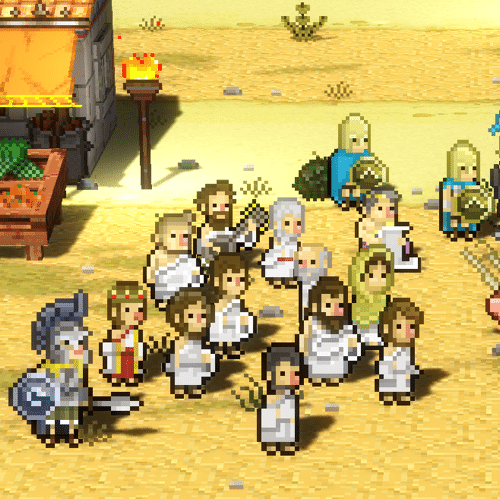 At first glance, it may seem that Okhlos isn’t a game with a memorable soundtrack, but I can assure you that it will at least trigger a head bop or two during your playthrough. It’s a great mix of classic and modern beats with sounds to create a sort of remixed version of classic Greek tunes. 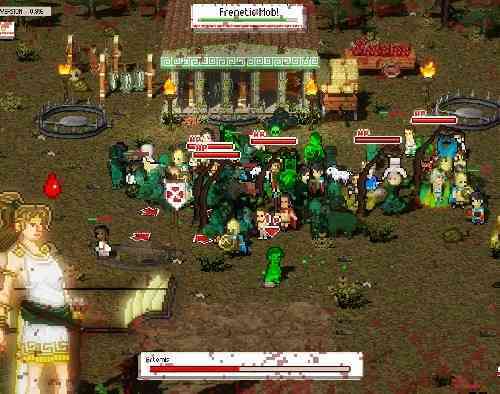 To say that Okhlos is repetitive is largely true, but it’s that repetitiveness that ultimately makes the game addictive. The narrative, gameplay, visuals, and even the music all combine to make a game that screams “angry Greek mob”. 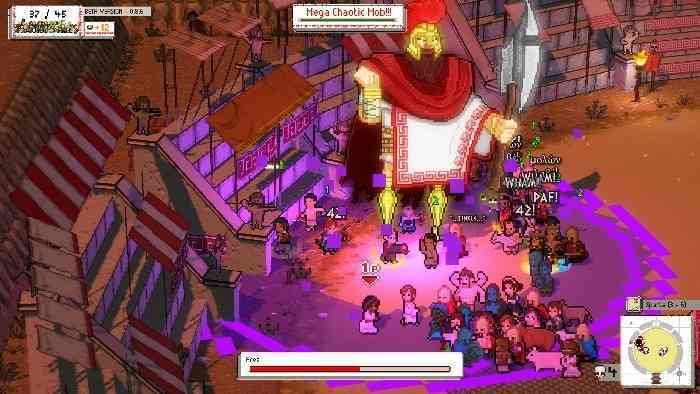 Okhlos is quirky, fun, and unique all under a simplistic and straightforward structure that makes it accessible and enjoyable for everyone.